Introduced in 1939, Ranger Joe Wheat Honnies was the first widely distributed pre-sweetened cereal. Consumers were encouraged to eat the new sugar-coated cereal as snack right out of the box. Sugar Crisp - introduced ten years later - is often incorrectly sited as the first pre-sweetend cereal. Originally distributed only on the Northern East Coast of the U.S. in the 1940's, Ranger Joe Popped Wheat Honnies was the the invention of Jim Rex, a heating-equipment salesman from Philadelphia. According to the book Cerealizing America by Scot Bruce and Bill Crawford, Rex got the idea for the cereal after watching his children douse their puffed wheat cereal with sugar. Ironically, Popped Wheat Honnies, the first sugar-coated cereal, was created in response to kid's putting too much sugar on un-sweetend cereal. Jim Rex developed a method of flash-baking cereal with honey and corn syrup which gave the cereal pieces a sort of candy-coating. Within 10 years of this cereal's introduction, the major cereal companies began using variations of Rex's flash-bake process. Sugar Crisp introduced by Post in 1949 was the first sugar-coated cereal from a major cereal producer. Ranger Joe Popped Wheat Honnies was eventually sold to the National Biscuit Company in 1954 were the cereal finally achieved national distribution under it's new name Wheat Honeys. In 1971, Wheat Honeys became Winnie-The-Pooh Great Honey Crunchers. One year later, the name was changed again, this time to Klondike Pete's Crunchy Nuggets. That cereal was discontinued in 1975. Click here to see all cereals from Nabisco. 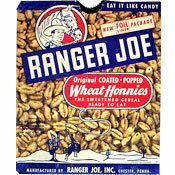 What do you think of Ranger Joe Wheat Honnies? Ranger Joe's sidekick was Rodger's wife Sally Starr. The Hazel-Atlas Glass Company produced the cereal bowl, ranch mug, a tumbler, and a rare six inch breakfast plate (found on the history site for this company). Blue decoration is considered more desirable than red. Tied in to the foods promotion and shows on TV/Radio, there was a Ranger Joe Day in Philly. I had a Ranger Joe cereal bowl that I used daily in the 1950s. Wish I still had it! One of my favorites when I was a child in the mid 40's. My favorite as a child. Have had the cereal bowl since I was little and a few years ago found the cup. No one but me seems to remember it but I loved it. Can anybody tell me what the words were to the Ranger Joe song? 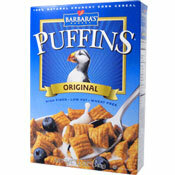 This was the cereal my father ate for years and was what I first remembered as a kid. We had the mugs and cereal bowls and I have a number of mugs still, plus several cellophane bags. My mother saved them to use as liners in freezer boxes (we were dairy farmers and had to be very self-reliant). American Pickers recently 'picked' a Ranger Joe mug on their show. I have a Ranger Joe coffee mug... wondering if it's collectable. Anybody know? Loved this cereal growing up! It came in a cellophane bag. Sugar coated or honey coated puffed wheat was my favorite from 1939-on and still is today. Made under many names but still I call it Ranger Joe.